Resolved: That the WSCFF encourage all firefighters to work with their respective fire departments to wear pink duty shirts October 25_28, 2010 to show their support for cancer awareness. WHEREAS: Currently, fire departments, fire districts and municipalities run levy and bond measures that are not decided by the majority of the voters. A super-majority is needed to pass these measures. WHEREAS: Even though a majority of voters may want to preserve the infrastructure of their city by funding these emergency service levies or bonds, a minority can now derail the desire of the majority. This is an affront to democracy and a prejudice against pro-infrastructure, pro-fire, pro-EMS voters. WHEREAS: Democracy holds that there is a wisdom inherent in the decision made by the majority, a super-majority undermines this principle by allowing a minority to make the collective decision. In the arena of fire and EMS funding, this lack of wisdom can translate into lost lives, lost property, lost property value, mounting insurance premiums and population/job flight from areas where emergency service levies and bonds fail. WHEREAS: Voters have already recognized the unfairness of a super-majority requirement for levies and bonds by recently voting to remove this requirement from all public school related bonds and levies. RESOLVED: That the WSCFF pursue legislation to eliminate the super-majority requirement for fire and/or EMS levies and bonds and make this resolution a top priority legislative issue. "In 2009, the state Liquor Control Board said taxes, markup and fees provided more than $332.7 million for programs and services throughout the state. Of that, $199 million went to the state's general fund, almost $63 million went to cities and counties and $49 million went to help pay for the state's health insurance for the poor." Back from the Land of Six Man Engine Companies, after two weeks. A place where medic/ambulance units are followed by a minivan of four more firefighter EMTs or paramedics. So here's a backlog of fire press releases from SFD. Now that I am back, I suspect these incidents will come to a screeching halt! NARRATIVE: On 07/09/2010 at 0508 hours, the Spokane Fire Department responded 4 engines, 1 ladder, 1 rescue, and 2 battalion chiefs to a reported structure fire at 801 E Hoffman. First arriving SE15 reported smoke coming from one of the units of a single story duplex. After ensuring all occupants were evacuated from both units, companies began a coordinated attack on the fire, which was located in the kitchen area. Crews achieved a quick knock down and were able to limit the damage to the structure. Of special note is the fact that the tenents stated they were awakened by the smoke detector, which gave them early enough warning that they were able to exit the structure without injury. The unit is uninhabitable due to smoke damage and the tenents are being assisted by the Red Cross. DAMAGE EXTENT: Damaged was confined to the kitchen area with smoke damage throughout the affected unit. 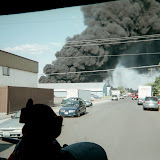 NARRATIVE: On July 6th 2010 at 11:46 the Spokane Fire Department responded 22 firefighters on 7 fire trucks along with two battalion chiefs to a reported commercial structure fire at 2501 East 29th.The business located at this address is Blockbuster Video. Initial crews on scene reported light smoke emitting from the eves of the roof. Crews conducted a search of the building for victims while others searched for the location of the fire with thermal imaging cameras as the amount smoke was increasing. All occupants were out of the building upon the fire department's arrival. Crews opened the ceiling and also cut a hole in the roof in their efforts to locate the fire. The seat of the fire was found in an exterior wall and was beginning to extend into the attic space. The fire was located and extinguished within 30 minutes. Ventilation of the building continued for another hour to remove the smoke. The building sustained smoke damage along with damage to the interior and roof from firefighting actions. The business will remain closed until repairs can be made. There were no injuries to civilians or firefighters. PROBABLE CAUSE: The cause of this fire is under investigation by the Special Investigation Unit of the Spokane Fire Dept. DAMAGE EXTENT: There was limited damage to the structure from firefighting efforts as previously noted. However, the contents and interior of the building received varying levels of smoke damage. INCIDENT ADDRESS: 2801 South Grand Blvd. NARRATIVE: At 5:37 PM on Friday, July 02, 2010 the Spokane Fire Department responded twenty firefighters on six trucks and two battalion chiefs to a reported apartment fire at 2801 South Grand Blvd. The first crew on-scene reported smoke showing from the second floor of a two-story stucco, multi-unit apartment building. Crews conducted a search of the second floor fire unit while others advanced hoses to locate and extinguish the fire. Other crews conducted ventilation operations outside and on the roof. The adult female lone occupant of the apartment contacted firefighters as they were conducting their fire suppression operations to report that she had returned home to discover the fire, and that the only remaining occupants in the apartment were her two cats. She had attempted to enter the apartment to rescue her cats but was driven back by heat and smoke. During their search, firefighters located both cats but were, sadly, unable to revive them. The fire was quickly extinguished and confined to the apartment of origin. The apartment suffered extensive heat and smoke damage and is uninhabitable until repairs can be made. Red Cross is assisting the occupant with lodging and necessities. PROBABLE CAUSE: The cause of this fire is currently under investigation by the Special Investigation Unit of the Spokane Fire Department. DAMAGE EXTENT: Heavy smoke and heat damage throughout the fire unit. No other units were affected. NARRATIVE: On July 1st 2010 at 08:46 the Spokane Fire Dept responded 29 firefighters on 8 fire trucks along with 2 battalion chiefs to a reported house fire at 713 W. Kiernan Avenue. The first arriving company arrived on scene within five minutes reporting heavy flames and smoke showing from a wood frame house. Initial reports indicated there may be victims trapped in the building. Fire companies made an aggressive fire attack along with a search for occupants. Within ten minutes fire was knocked down and search was completed with no victims found inside the home. Two occupants who had escaped the fire prior to Spokane Fire Dept arrival were transported by ambulance to Holy Family Hospital to be evaluated for smoke inhalation. Due to the extensive fire damage fire crews remained on scene for four hours extinguishing fire hidden in numerous voids and features of the structure. In addition to the injured civilians 1 firefighter received minor burns and was transported to a medical facility for treatment and was released back to duty. Three occupants are displaced from the residence and are being assisted by Red Cross for shelter and clothing. DAMAGE EXTENT: The house suffered extensive smoke and fire damage to the first floor and roof. NARRATIVE: This evening (Saturday June 26, 2010) at 7:09 PM, 6 Companies of Spokane Firefighters; 3 Engines, 1 Heavy Rescue, 1 Senior Ladder and 1 Pumper Ladder responded to a reported fire at 2721 W. Lacrosse Ave. Fire Dispatch reported to the responding crews that there was a reported fire in the kitchen in the home at this location. Spokane Fire Lieutenant Greg Borg, who lives in the neighborhood, recognized the address as it came over his home radio scanner. Lt. Borg ran down the street, located the home and made a quick knock down on the fire with a personal fire extinguisher. Arriving firefighters from station 16 under the direction of Lt. Jason Reser were the first "on duty" firefighters to arrive at the scene. Engine 16's crew extended a hose line into the home for final extinguishment and checked for any additional fire extension. The quick responses from Lt. Borg and E16s crew confined this fire to the stove/oven unit and some cabinet work in the kitchen. There were no injuries at this incident and the numerous cats living in the home were somewhat frightened, but unharmed. The cause of this fire was cooking related and accidental in nature.